A couple of weeks ago I finished the tiniest thing I've ever made. 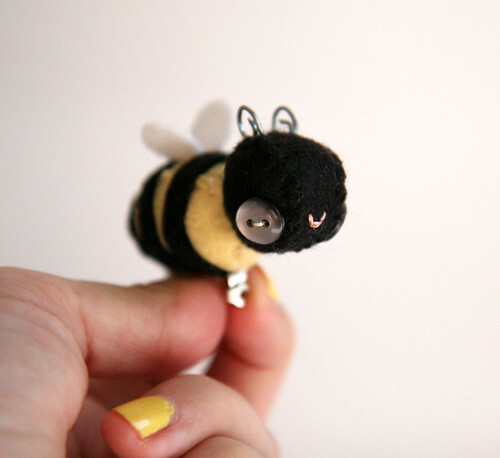 It was a bumblebee brooch with a very special story, and I was so happy to be a small part of it. I wish I would have gotten a picture of it fastened to my purse! It made me want one for myself! 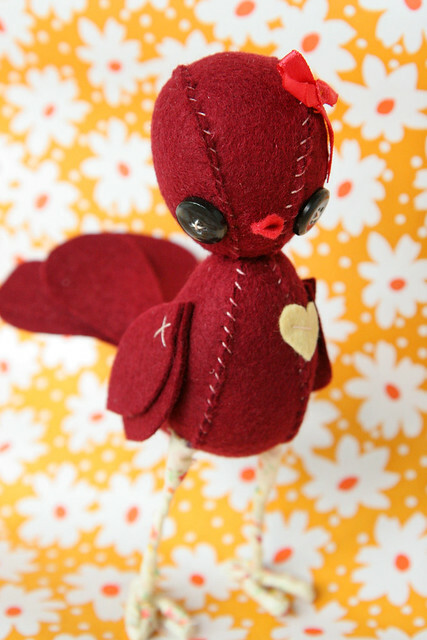 One little note: this bird does have wire and will be set on a high shelf for her. Don't worry! Love them both, but that bumblebee is darling! LOVE! aww ruby bird is absolutely adorable!! I love it!! 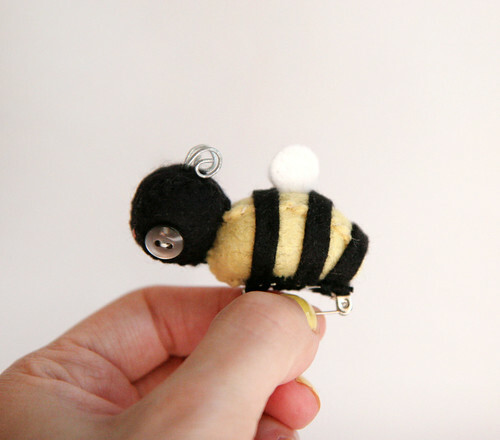 the bee is cute too! You are so talented! They're amazing! You are so, so incredibly talented! wow! I am always in awe of your sewing skills--these are so cute! You are so talented, Katie. I really love your style - it's so precious and unique. Keep up the creativity! awe! those are so cute!!! i'm in love with the little bee!!! Those are both so beautifully sweet!! First, you need to make more of those brooches! That bee is fabulous! Second, the legs on that little bird are awesome! Your little creatures are absolutely amazing!! I just wanted to say that I love your blog and your work! I'm actually wondering if your still making animals on order for people. In that case I would be really interested! I'll keep a close eye on your webshop, but if you might have the time to answer my question per e-mail, that's possible (ia.peters@hotmail.com). 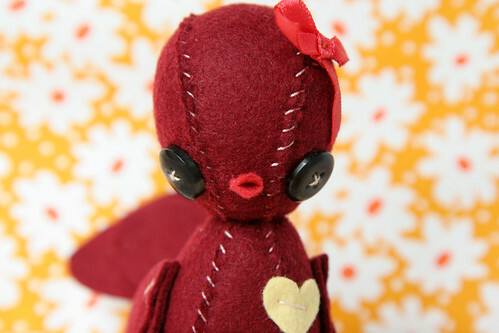 Just discovered your blog and creatures...the ruby bird is amazing. Have you ever made a rooster? My mother collects funky roosters and it would be the perfect gift! Okay...I'm IN LOVE with the ruby bird...wow!! !